One reason gold has been used as a store of value and medium of account is because of its low annual supply growth. The optimal money would have zero supply growth. In a free market for money, money would appreciate in value every year. Therefore, banks would no longer pay interest on deposits. Instead, depositors would choose between a deposit contract, a mutuum contract, or a private equity investment. A debt-based monetary system must be inflationary because interest payments must be made. As investors gradually purchase cryptocurrencies and pay off debt in the fiat system, the fiat money supply will contract over time. We want to Thank Saifedean Ammous for having an exclusive conference call with Demelza Hays and Mark Valek from Incrementum. 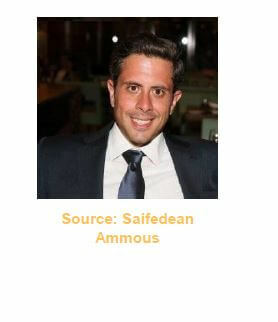 Saifedean Ammous is a Professor of Economics at the American University in Lebanon, and he is the author of the bestseller The Bitcoin Standard. 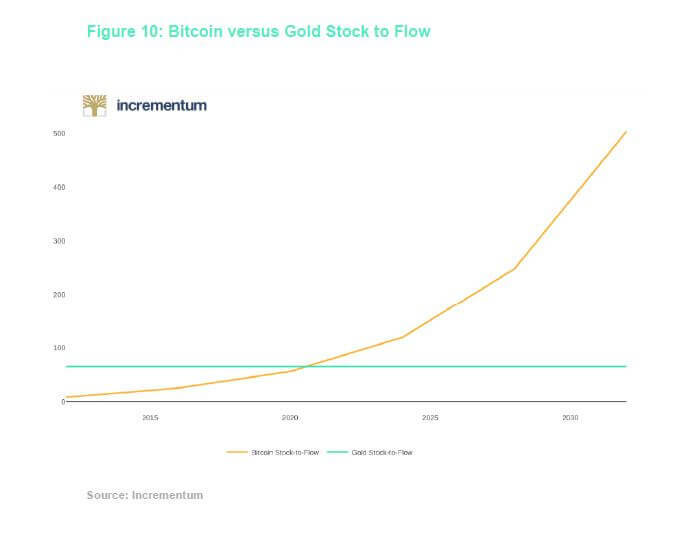 Even though gold has a very high stock-to-flow ratio, Bitcoin will soon have a higher one. Its capped supply is one reason Saifedean Ammous claims that Bitcoin is even better than gold. In the figure below, Bitcoin has a stock-to-flow ratio of around 71 currently, but by 2020, because of the halving, the ratio will be going up to 119. In The Journal of Structured Finance, Saif wrote a paper, “Can Bitcoin’s Volatility Be Tamed”, about how the price of gold is affected by the demand from the jewellery market and industry. When people sell gold excessively, the price of gold drops. However, demand from jewelry makers and industrial fabricators absorbs the price drop, which creates a lower bound for the price of gold and has a moderating effect on the volatility of gold’s price. As Saif explains, fluctuations in the demand from industry cause gold’s value to fluctuate and prevent it from being a purely monetary asset that reflects monetary demand only. He says that gold is not money because of its industrial activity. Industrial activity is secondary in the determination of the value of gold. For Mises, a money that has only a monetary demand will be a superior form of money because the value of money will be based purely on time preference. According to Saif, in a situation where Bitcoin becomes the only money in the world, hypothetically speaking, then the demand for Bitcoin is just the demand for cash balances. In other words, Bitcoin demand is a reflection of time preferences. 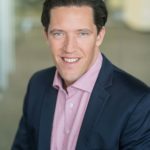 Mark Valek, author of The Crypto Research Report and fund manager at Incrementum, compares Saif’s idea with the “reservation demand with gold”. The volatility of gold, due to this reservation demand, will probably always be lower than Bitcoin as long as Bitcoin is only a store of value and only potentially has monetary demand. However, in the future, if hypothetically a majority of people adopt Bitcoin as unit of account, the volatility would be lower than gold because Bitcoin would be the denominator of goods and services. In fact, if one starts using Bitcoin to measure goods and services the volatility would go to zero, like during a gold standard. Mark compares the predetermined stock-to-flow ratio of Bitcoin with other rule-based monetary policies, such as Milton Friedman’s automated k-percent rule and John Taylor’s Taylor Rule, that attempt to stabilize the purchasing power of money over time. On the other hand, these attempts do not achieve long-term sustainability because of political tension explained by Gordon Tullock and the Public Choice literature on economics. However, Saif does not believe that the k-percent rule and Bitcoin’s algorithm are equivalent. “The key thing for me is that the value of money should be determined by the market for money, which is the supply and demand for cash balances.” The supply and demand for money are what determines the price and the interest rate for money. It is very different from the rule-based monetary policies because they want to calculate the right price, and then they want the market to adjust. Can a Deflationary Monetary System Work? “Yes, I definitely agree on that,” answers Saif. “I go even farther than most Austrian economists. In a free market for banking, depositors would not earn any interest on their deposits because the money would be appreciating in value, which is the real return. Essentially, lending money to the bank enables depositors to save on the cost of securely storage money. The second kind of money would be the direct equity and that is the model of Islamic banking, which is also the model of traditional banking. If you are going in on an investment, I think what it comes down to is what society accepts to be legitimate. If a society accepts that it is ok for the government to impound the property of the borrower if they can’t pay back, then effectively you are monetizing the property of the borrower, which is the collateral. Thus, you are effectively monetizing the collateral. Interest lending carries collateral that can be impounded and repossessed by the bank. Effectively, it makes the certain asset monetized because you have issued a loan backed by that asset which is not money, it is a house or car or a piece of land. That kind of business model is only accepted in places when it is fine for the government to impound that property when the borrower defaults. On the other hand, if the borrower’s collateral cannot be impounded, then lenders often reject these kinds of deals and banks do not engage in them. However, in this monetary system, investors would not necessarily need to risk their Bitcoin in a security investment, such as stocks or bonds, but they would still experience an appreciation of the currency in form of a real increase in the purchasing power of money. If investors do lend out Bitcoin to a bank or financial intermediary who pools the risk of their borrowers, then the bank should pay a fee to the depositor for accepting counterparty risk.“ So, there may be a case for such a thing as a low-risk interest rate investment but probably the tendency would be much lower to take this kind of risk. This is just a minor disagreement,” Mark adds. Mark responded to the full reserve argument with the common critique posited by mainstream economists, “Will a deflationary monetary system hamper growth like the Keynesians claim?” Mark holds that a debt-based monetary system needs inflation in order to stimulate research, development, expansion, and intervention. 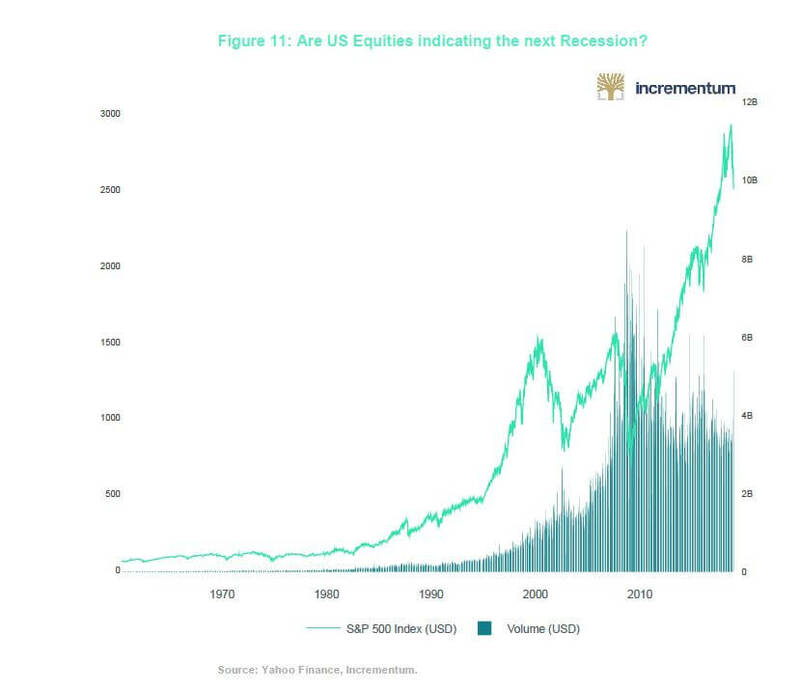 However, under the classical gold standard, capital markets still existed. Even though there was some kind of gold flow or inflation, the productivity was higher than the inflation rate of gold. 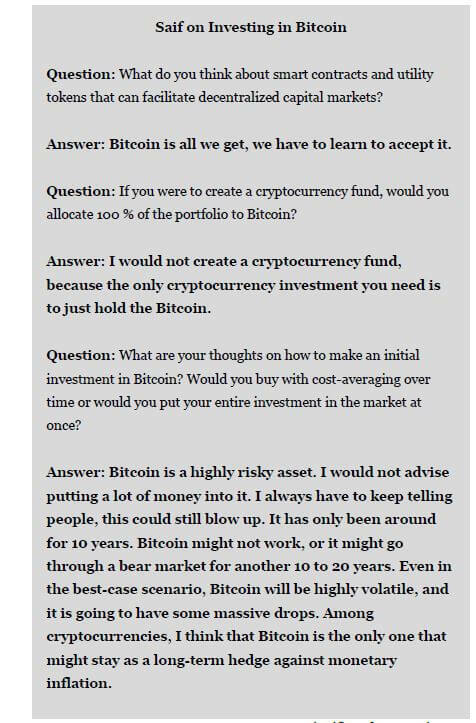 Saif’s answer: “For the first time, people have an alternative; they can opt out of central banking. This was not possible before Bitcoin, but it is possible now. Bitcoin will limit the ability all these government from inflating. You can imagine Bitcoin developing a so-called monetary Batman that is hanging in the shadows of every central bank and is waiting for that central bank to begin inflating the money supply, and then people in that country would jump into Bitcoin. When they jump to Bitcoin, its value will significantly appreciate. Mark echoed Saif. “We are very much on the same page because, even though we are optimistic, I think that from a portfolio point of view investors do not have to allocate a huge amount to have an impact. Investors can allocate a low-digit percentage, even as low as 1 percent of their entire net wealth, and it will have a huge impact if Bitcoin monetizes. Mark explains that Bitcoin is a binary investment. Either Bitcoin becomes some kind of monetary asset and store of value, or Bitcoin will be succeeded by something else and the price will go to zero. Positive scenario: Bitcoin becomes a reserve asset for central banks. A domino effect could prompt more nations to buy Bitcoin to protect against speculative attacks and to ensure that public debt can be paid off with investments in Bitcoin. The Marshallian Islands already have investment in Bitcoin, and the Central Bank of Barbados wrote a paper on the topic in 2015. Negative scenario. Loss of confidence in the fiat system, and there will be a huge rush into the new safe haven being Bitcoin. See “Transaction Costs and Tethers: Why I’m a Crypto Skeptic,” Paul Krugman, The New York Times, July 31, 2018. See A Monetary History of the United States, 1867–1960. Bagus, P. (2015). In Defense of Deflation. Springer.